Circuit Breakers hit Steam at the tail end of 2015 with a frantic local co-op mode in tow. Shortly afterwards an Xbox One release was teased for the future. Developer Triverske has finally earmarked that window for February 2017, unleashing a few screenshots to remind us how insane this game truly is. 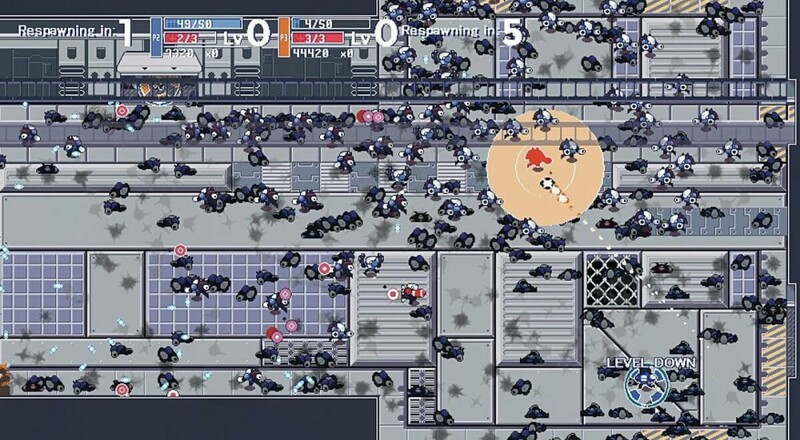 Circuit Breakers plays on the old arcade formula of shooting all the things until they're dead. You and the other local players sit down and fire away in a series of intense, enemy-filled settings tuned to keep you on the edge of death. Endless arcade and score-based modes give the action a little variety, as does a core customization feature and a handful of upgrades. But really, it's all about the shooting. Circuit Breakers is currently available on Steam. The Xbox One version is set to arrive in February with support for six player local co-op.